Guess what happens when you mix salad and pizza? You get salad pizza! Yes, it is possible to marry the two and make a killer dinner or lunch recipe from two food staples. 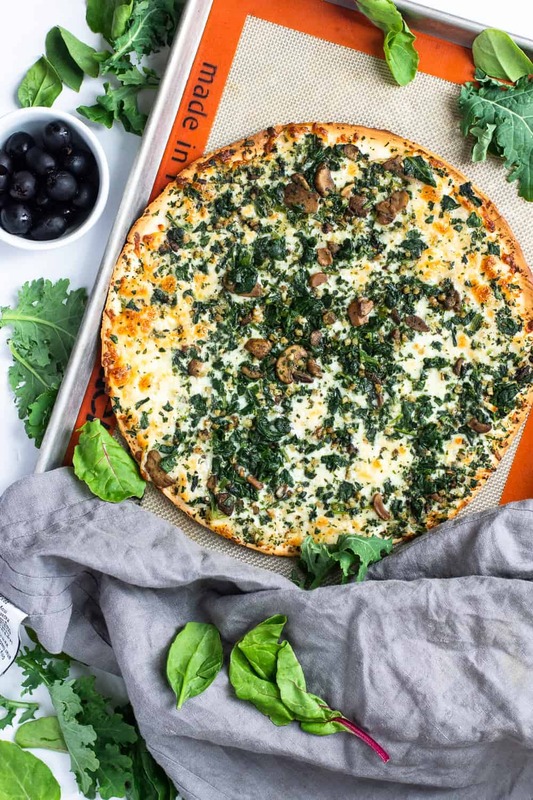 I am super excited to share this incredibly delicious, easy spinach and Tuscan chicken chopped salad pizza! First you need the right ingredients! And easy ingredients, obviously. I used the brand new Freschetta Gluten Free Spinach & Roasted Mushroom Pizza, and the Gluten Free Tuscan Style Chicken Pizza as a base. Their flavor is amazing, and the crusts are flaky and delicious. So much so, that my kids and husband prefer eating them to regular pizza. It’s all about that crispy factor, am I right? 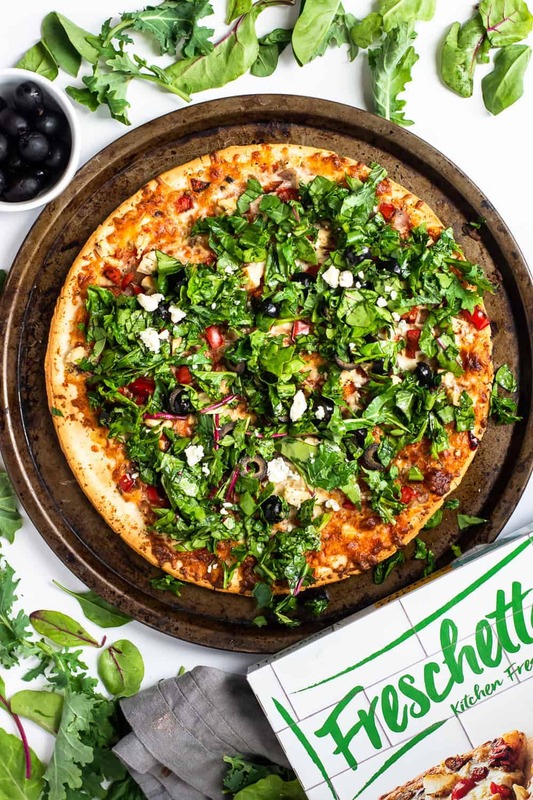 As an added bonus, these pizzas are certified by the National Celiac Association! Step 2: Chop the salad ingredients. Toss in olive oil and balsamic. Step 3: Slice the pizzas, top with salad and some crumbly Gorgonzola. Step 4: Dig in and let your taste buds go crazy! 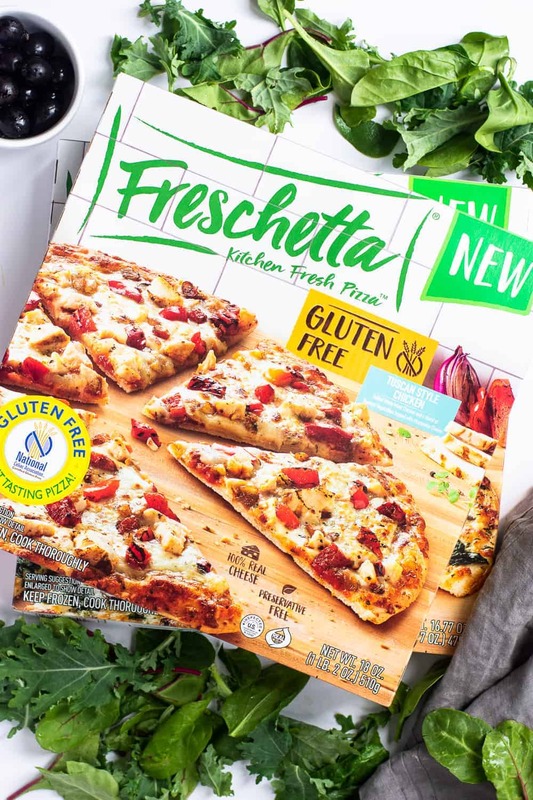 In celebration of the new Gluten Free pizza flavors, Freschetta is giving away a year’s worth of free pizza! Check out their Facebook page to enter to win. Honestly, this is a fantastic way to dress up a frozen pizza, and give the old salad and pizza meal a fun twist. You can get as creative with the toppings as you like. 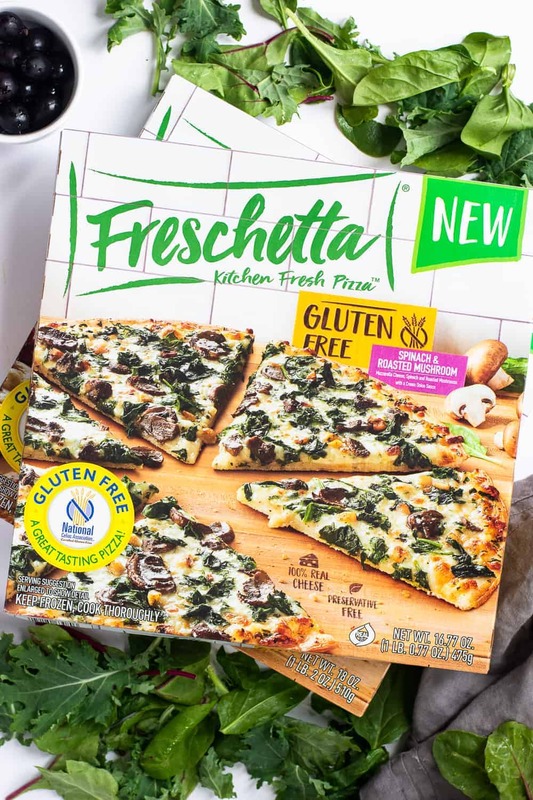 I like that the Freschetta Spinach & and Roasted Mushroom and Tuscan Style Chicken Gluten Free pizzas already have great flavors and toppings. The salad on top adds an element of fresh, crisp greens and makes it a pretty dish. Keep an eye out for these new Freschetta Gluten Free flavors in your local store. Looking for other ways to make frozen pizza sassy? Check out this post about 3 ways to make the best gluten free frozen pizza. Hint, hint: again, it’s all about the amazing toppings! Ready to get your chopped salad pizza party on?! I thought so. Grab the recipe below and enjoy! Make this easy spinach and Tuscan chicken chopped salad pizza in 15 minutes. 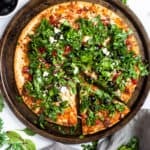 A fun way to dress up a simple pizza and salad dinner! Bake pizzas on 450 degrees F on rack for 10 minutes. Remove and let cool. While pizza is cooking, chop salad ingredients, and toss in a bowl. Set aside. Slice pizzas, then top with salad. Serve immediately. Enjoy!